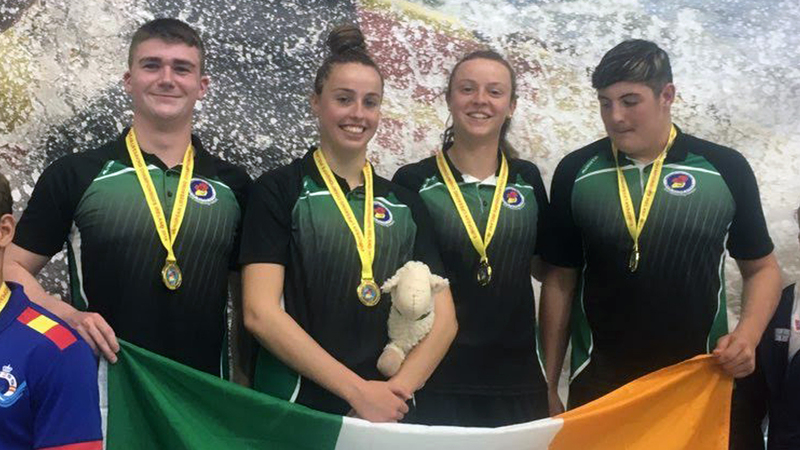 Sean Slattery from Fermoy won a gold medal in the simulated emergency response competition (SERC) with his Irish team mates Noel Shannon, Tara McEvoy and Amy O’Brien at the European Junior Surf Lifesaving Championships on Wednesday (September 12). Sean also broke an Irish record on Wednesday in the 4 x 25 Manikin Relay with his team – Calum Holding from Cork, Ryan Cotter from Cork and Noel Shannon from Clare. There are 13 countries competing at the European Junior Championships including Ireland, Germany, Netherlands, Italy, Belgium, Sweden, Switzerland, Norway, Czech Republic, Great Britain, Spain, Poland and Denmark. The competition is being held at the University of Limerick Sports Arena Olympic swimming pool and at Kilkee beach. Sean Slattery (left) pictured with his teammates Noel Shannon, Tara McEvoy and Amy O’Brien in UL on Wednesday. 6th year student Sean, who works as a part-time life guard and Level 1 swim teacher at Fermoy Leisure Centre, has been involved in surf lifesaving competitions with the past five years. Sean is also a member of Fermoy Swimming Club. Sean was selected on the Irish team for the European Junior Championship having trialed for a slot earlier in the year. Castlelyons native, Sarah Morrison was also selected for the Irish team at the European Junior Championship but will not be competing until Friday (September 14). The competition is ongoing and there will be a full report in next week’s edition of The Avondhu when both Sean and Sarah return home from their international exploits.